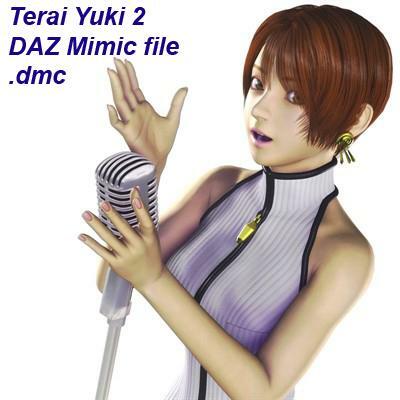 I couldn't find a Daz Mimic file (.dmc) for Terai Yuki 2 anywhere - so I made one of my own. It may not be perfect, but I think it works pretty well... and the best part is... it's free. *Tip: Mimic works much better with real voices than it does with computer-voices. spearcarrier (3 years ago) Inappropriate? Super awesome. Thank you. I know this was tedious. omnipotentz1 (5 years ago) Inappropriate? Papasmrfe (5 years ago) Inappropriate? Mimic gives you the option to direct it to where the .dmc file is that you want to use, so you can put it anywhere you want, as long as YOU know where it is.